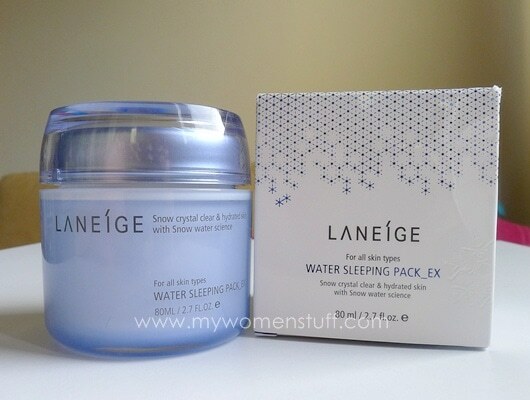 It reminded me of my first experience with the Laneige Water Sleeping Pack many years ago, when I’d first heard of the brand. We didn’t have a counter here then, so I picked up the Water Sleeping Pack from the Laneige store in Hong Kong. The sales assistant in store told me it was their bestselling product. I bought it and tried it but it didn’t give me wonderful results. I also did not like the scent which I found sharp and very floral. Oh and I found it sticky. I don’t think I ever finished that tub. Happily, all that has changed. That was over 5 years ago and now, I find that the Water Sleeping Pack EX comes in a sturdy looking jar. The texture appears less gel-like and more like a gel-emulsion, and it is no longer sticky nor chemical scented. Whew! The texture now is thicker and it is more opaque. It spreads easily on the skin and absorbs into my skin without feeling sticky. This is a sleeping pack, which for the uninitiated, is a mask you use while sleeping. You apply it on your skin after your moisturizer and go to sleep. You do not have to wash it off, only when you wash your face in the morning, and it works all night to deliver moisture into your skin. I’d incorporated this sleeping pack into my hydration regime and I have found that it helps my skin remain hydrated and ultimately looking better. Its a million times easier than putting on a sheet mask or cream mask, both of which you have to wash off or use before applying skincare. I sleep in an air conditioned environment which can be drying, so a sleeping mask used about 3-4 times a week is very useful for me. What I also like is that I can slap it on, and then go straight to bed without fuss. Here’s another way I use it. When I have had a rough day, or I notice my skin looking a little dull from stress, or if I’m having a late night, I slap on this sleeping pack after my skincare; and wake up the next morning with skin that looks brighter and better and more rested. I do however have to caution against using a thick layer. That was what I was advised before and I did not like it. It felt sticky and I was concerned about spreading it all over my pillow. So what I do is apply enough gel to be thicker than regular moisturizer but not so thick as to feel sticky and tacky on the skin and leave it. It absorbs quite quickly into my skin so it does not feel sticky thereafter. When I wash my face in the morning, it does not feel slippery or oily. I guess they have improved on this product. I had no adverse reactions to this product. It felt just like another gel moisturizer on my skin, but I have a friend who felt a slight tingling on her skin. It did not break her out nor turn the skin red, but it tingled so that might be a point to note. Xin uses her straight after her serum, in place of moisturizer. I on the other hand, as my concern was hydration, use it after a gel moisturizer. 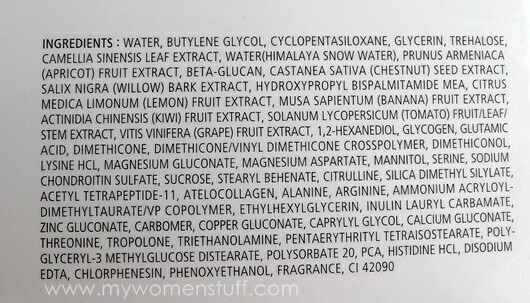 Cleanser -> Toner/Lotion -> Serum -> Moisturizer -> Sleeping Pack. I keep it on my dresser and dip into it every alternate day and this, together with my hydration regime is definitely giving me much better, smoother skin. You can get free samples of this from the Laneige Malaysia website or try asking at the counter. If you have a Laneige Water Sleeping Pack EX experience to share, you could win RM500 worth of Laneige products! Find out more here. EEEEE I’m feeling like trying this! That’s a bit early to have dry skin y’know… but it could be all the air-conditioning esp at Uni. I remember lecture halls being like the tundra. I’m loving it since early 2011. Once it absorb to my skin, it feels soooo good! 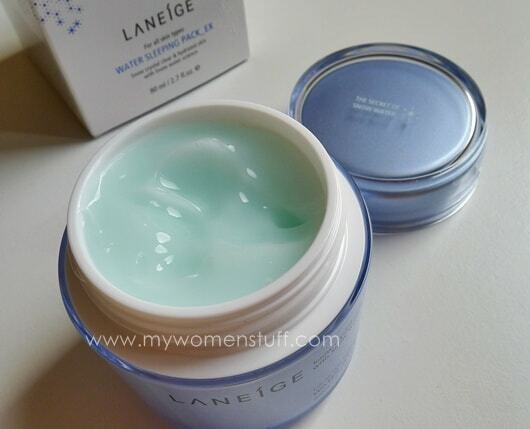 :D. Maybe this is the best product from laneige I ever try. I used their older formula, which was okay. I don’t think I finished it as the scent got to me after a while. Oh so you remember the white tub too? That smell really got to me. It was so sharp! oh it has been reformulated! the older versions had alcohol in it and that was what put me off buying.. oh dear, paris, there goes my no-buy resolution…. I think the 2nd item could be alcohol… but then chemistry isn’t my strongest point 😛 Best check it out if you might be sensitive to alcohol! this stuff is magic isn’t it? and very kind to the wallet too =p I have been using this for a few months now and my cheeks do not feel as tight as they used to be when I wake up in the morning! I am using my 3rd jar now. I absolutely love it. Can see the difference when I wake up in the morning! i love this water sleeping pack <3 am on my 2nd tub of it already! So glad to know you’re liking it too! This new formula really does work a lot better than the old one for me. Mine was in pump mechanism type. Cons of the packaging is i dunno how much is left inside coz I cant see inside. But the product is fab and work wonderful as u described! I think Isetan is having a promo where you can get it for RM 80 now. That’s great news! Thanks for the info! This sounds so refreshing!!! But will it suit a combination-oily skin??? Oh I have to agree with you re: samples feeling better than the full sized products. Sometimes I wonder why this is the case too. I like the samples, buy the full sized and then find it doesn’t work for me. My sis bought this and i took some of it from her to sample . It didn’t work for me at all. Think i’m back to my oils, balm and serums. I used the old Laneige Water Sleeping Pack ages ago when it’s still the old packing. The impression I had from that product was quite negative that I have never made any purchase from Laneige ever since. I’m glad that there’s a new formula. Sounds like a great one to have for the dry and cold winter season. Hopefully it’s available at Sasa.